It’s a joke as old as time, but when you really think about it, how many socks have you lost in your life? It’s a lot, isn’t it? Even as an adult, socks just seem to turn up missing more than other articles of clothing. The dryer eats them, they’re stuck in the bottom of a hamper you don’t use anymore, lost in a drawer somewhere, or maybe they’ve just…disintegrated. Odds are, you have at least one drawer in your bedroom dresser set aside for socks and other undergarments. 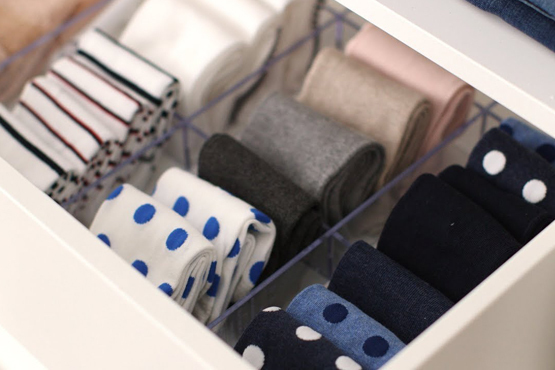 Part of the problem might be how you store them—a cluttered drawer can easily lead to socks going missing in the shuffle. The next time you put socks away (or if you’re feeling bold enough to empty and reorganize the whole thing), try this: instead of binding them together by the elastic, place them on top of one another with the heels sandwiched in the middle, and then fold them over one another. This will help them stack more neatly in the drawer and lessen the risk of any of them wiggling themselves free. If you have too many socks for that last idea to be viable, or if your current drawer configuration makes this a little harder to do, you may be able to make the drawer itself work a little harder for you. By using something like a small cardboard box, wire basket shelf organizer, or even pantry organizers to help separate your socks from the other contents of the drawer, you can better keep track of everything and stop the rest of your drawers from getting out of hand. One of the biggest reasons socks go missing is due to the presence of other, bulkier garments like shirts or pants in the washer. This might not work for everyone (such as people that have to pay per load of laundry) but whenever possible try to wash your unmentionables and your socks in a load all of their own. It’ll prevent loss and make it much easier to put them away later! Wherever you store them, as soon as they’re washed and ready to go, you need to make sure they’re paired up and ready to get put away when you get them back to your room. As soon as you can, get your socks sorted, matched, and in the drawer to prevent losing one in the shuffle. No matter how secure your laundry bag may be, this is the best way to ensure less of your socks go missing over time. Have you found a way to prevent the loss of solitary socks? Drop a comment below!